Where is it? Scapa Flow, Orkney, Scotland. What is it? Scapa Flow is one of the UK top dive destinations. 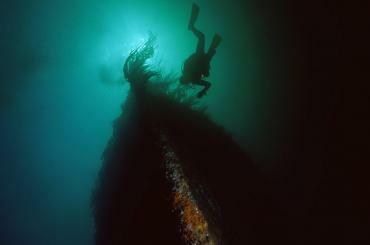 Most of the diving is done on the famous 1st World War wrecks. The German fleet was scuttled in the flow just after the war ended and their wrecks are still incredibly intact. They range in depth from about 16m at the top down to 40m at the base. The wrecks are huge and the gun emplacements are still intact. Other dives are done on the shallower blockships: The Tabarka is one of the most incredible dives you’ll ever do with up to 20m of vis inside a cathedral like wreck in only 16m of water! All the diving is conducted off the liveaboard the MV Invincible, which has an onboard compressor and drying room. What does it cost? £500.00!! 6 days diving (2 dives per day). Accommodation (in twin berth cabins) on board the MV Invincible. This will be in harbour during the night so you're able to get off and have dinner on land! A continental breakfast on our way to the first dive. A good Scottish cooked breakfast to welcome us back from the first dive. Homemade soup after our second dive when we're on our way back to Stromness. 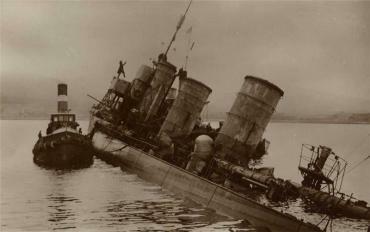 Ship sinking in Scapa Harbour. Transport: There are a number of ways to get to Scapa Flow but the cheapest option is to drive. Our friends at Diving Leisure are offering to help with car pooling from London - let us know ASAP if you think you would like to join one of their vehicles. The drive takes about 12 hours to get from London to Scrabster where we pick up the ferry across to Stromness. There are 3 ferries a day and we’ll aim to get the 8.30 am one. This means we will depart on Friday the 17th!! Equipment hire: We can arrange equipment rental - please contact us for individual item hire. Nitrox & Trimix are also available at an additional cost on the boat. To rent cylinders on the boat costs £50 for a manifolded twinset and £30 for a single 15 litre cylinder. Just give us a call with your card details to secure your place with a deposit - full payment will need to be received ASAP however. VERY LIMITED SPACES GOING FAST, FIRST COME FIRST SERVE BASIS!! Your boat for the week is the largest diveboat in Stromness! With an overall length of 25m she provides a very stable platform for diving. The accommodation is in twin berth wooden cabins and each cabin has its own radiator and hand wash basin with hot and cold running water. Each bunk has its own 240 volt socket and reading light. There is a heated drying and changing room. The boat has two showers and two toilets. There is a galley and our very own lounge bar onboard! It comes equipped with widescreen TV/DVD/VCR and surround sound. There is a library of DVDs and books for your use. The bar is fully stocked with bottled water, beers, snacks and soft drinks. Our skipper for the week is Ian. He has been diving since 1978 and used to be a commercial diver and a scallop diver but now just dives for fun. This trip is being run with our friends at Diving Leisure London. Click their logo to go to their website and see if you recognise any of them!